A web site for publishing discursive articles on philosophical and religious topics. Why I am not a Fundamentalist, a discursive essay (in PDF format), also available in Microsoft Word format and in HTML format. New: The Bazlinton Collection. Photos of Brethren in the 19th and early 20th centuries. A Brief History of the Brethren, (60 pages) published in 1968 by Ian McDowell and made available here by kind permission of the author. 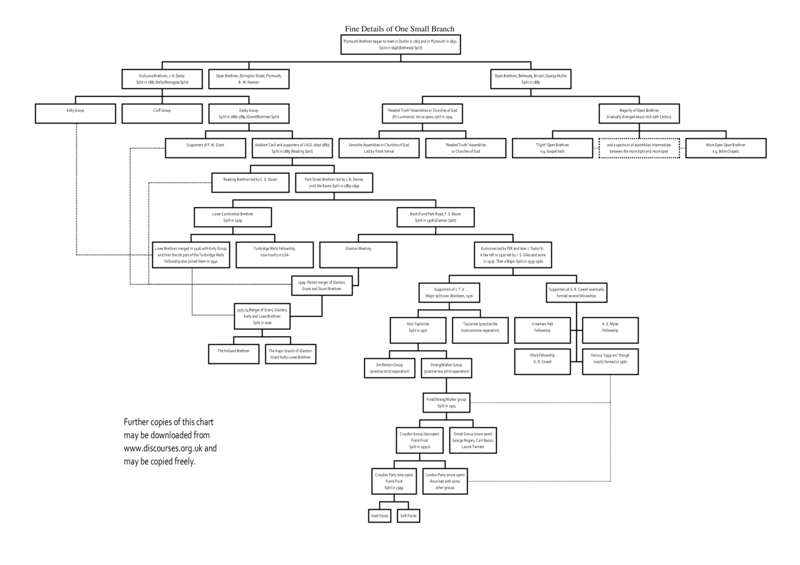 Dendrogram, a 3-page Microsoft Word file, an attempt to summarise the evolution of Plymouth Brethren groups and subgroups from 1825 to 2000. The chart relating specifically to Brethren is on page 3 and is best printed on A3 size paper. Some printers will work better with one of these alternative formats, which you can download by clicking them: PDF file, JPG file, PNG file or GIF file. These are mostly based on Gilbert and Sullivan songs, and depict various aspects of life among the Exclusive Brethren, sometimes with humour, sometimes with pathos. Click on any cell of this table to download the words or the music or the full score with interleaved words and music for printing. If singing along with the MIDI file, wait for the introduction (usually piano) to finish before the choral entry (usually oboe). The Opening Day of the Three-Way Beatings: nonsense verse written in imitation of Lewis Carroll's Jabberwocky poem. If you want to send me a message, click here.